This simple CD was released for voters in the various Awards organizations. 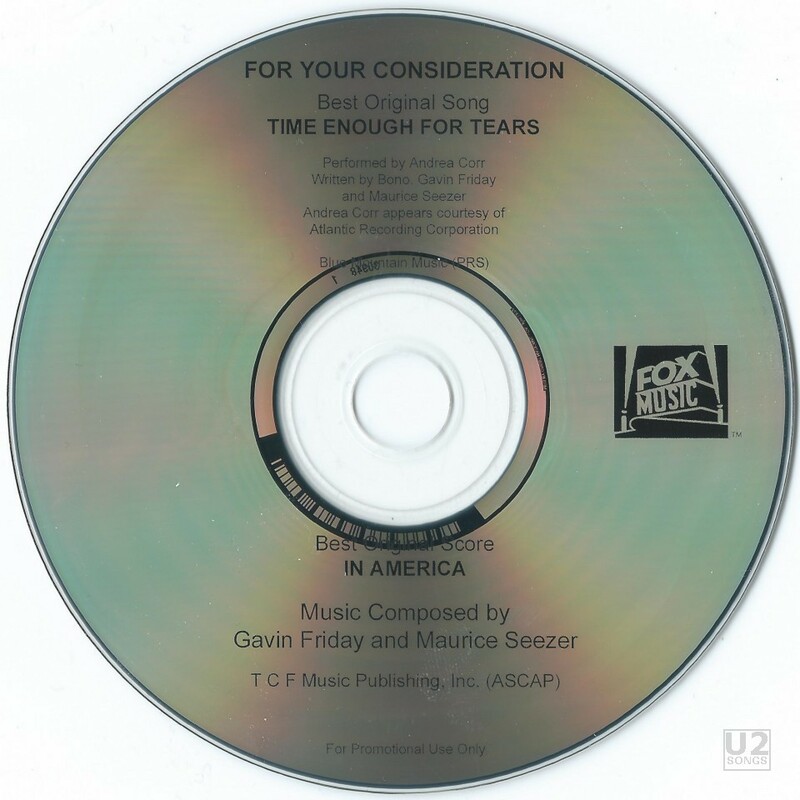 It contains the song “Time Enough for Tears”, taken from the soundtrack In America, performed here by Andrea Corr, and written by Bono and Gavin Friday. The CD was intended for votes to consider the track for the various awards such as The Golden Globes and The Oscars. The promotion worked and the song was nominated for a Golden Globe at the 2004 ceremony. It however did not win the award, and that honor went to “Into the West” by Annie Lennox from the movie The Return of the King. The CD itself is plain with just some text in black, and the Fox Music logo on one side. It was released in a generic slimline jewel case with no known inserts. The song included here is the same edit as that found on the soundtrack for In America, but is different than the version that The Corrs would include on their own album. The CD also makes mention of the score from the movie as a nominee for Best Original Score. Indeed five tracks from the score are also included but are not identified by name on the CD. These follow the Andrea Corr track. Written by Bono, Gavin Friday, and Maurice Seezer. Andrea Corr appears courtesy of Atlantic Recording Corporation.